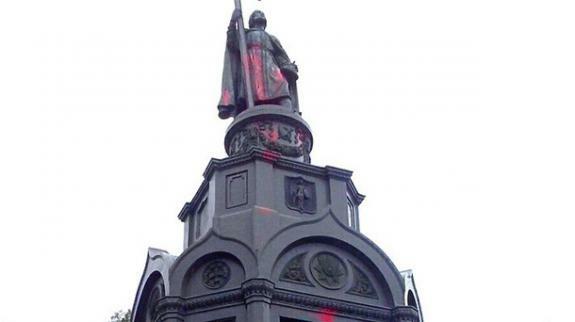 Moscow, September 27, Interfax - Unidentified criminals poured red paint onto the monument to the Holy Prince Vladimir, the Baptist of Russia. The question about initiating a criminal case is considered, 112.ua website reports. It is the oldest monument in Kiev, it was constructed in 1853. It is located on Vladimir Hill on the bank of the Dnieper River. The author of 4.4 meter statue is Peter Clodt, 16 meter plinth was made by Alexander Ton, bas-reliefs by Vasily Demut-Malinovsky.